A man's enagagement ring with heat treated black diamonds. 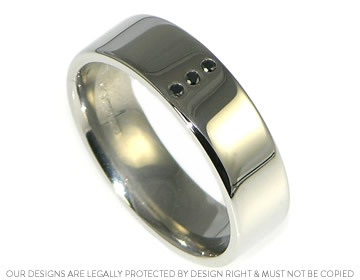 This simple yet striking palladium man's engagement ring is approx 7mm wide and has a reverse D shape profile. At the centre front of the ring are three 1.5mm brilliant cut heat treated black diamonds that have been vertically invisibly set. To finish, the ring has been polished to a high shine.